Comic Genesis Forums • View topic - Post your Space Tan art here! Post your Space Tan art here! Last edited by Risky on Tue Jun 07, 2005 9:36 am, edited 2 times in total. Muahahahahaha. I think I win. What if she is Gen-Chan secret identity or so? It is TEH TRUTH! Hehe, brilliant. Who's this spacechan you're talking about? Gen-chan's growing up... now's a teen. Sorry again, but i really can't make cute and innocent looking girls. Very 'spif. Very 'spif indeed. Also, what is it with anime and non-matching pant legs?! I think i'll settle for head surgery, and change it soon. Last edited by Jops on Tue Jun 07, 2005 11:19 am, edited 1 time in total. Tim wrote: Was Space-chan ever that violent? If she wasn't, she should be!!! That dress is hawt. I love it. Wow... man I can't wait until she's legal! The dress is awesome, Jops. 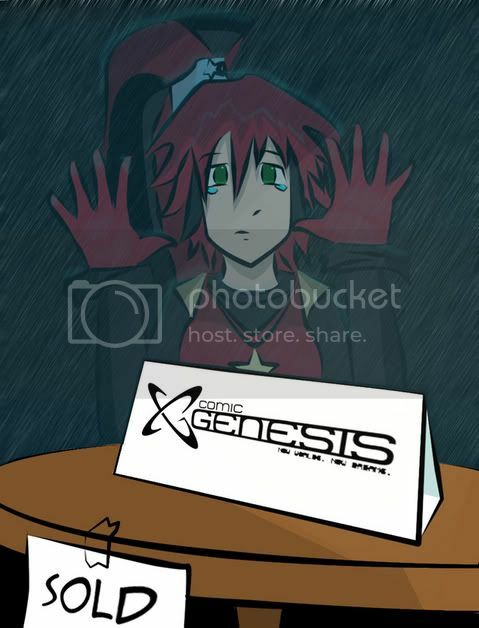 You know, if we're going to be ComicGenesis, we should hold a 'Dress up Gen-chan' competition. Incidentally, have we changed our colour theme from red and black to black and blue then? Phalanx wrote: Incidentally, have we changed our colour theme from red and black to black and blue then? Makes sense. I don't have anything against a color change, and anyway, if we're getting a new name and a new mascot for the new name why does the color scheme need to stay the same? Anyway, black and blue is pretty. Well, the next thing to do with my logo - assuming it gets accepted, of course, but that seems pretty likely just now - would be to play around with possible colours. I'll do a black and blue version, but I usually try for (and prefer) odd and interesting colour combinations first. More original. Anyway, blue and black reeks of sci-fi,* especially if the blue glows (See: Tron), and Keenspace is more general than that. * Which is why my own comic will use blue and black when it gets to the point that the website design actually shows up. Eh, I like the new colors. Blue and Black don't have to mean sci-fi. It's just a color motif.